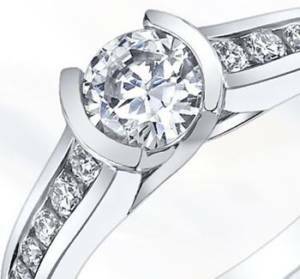 Before you design an engagement ring, you need to decide on the type of engagement ring settings. 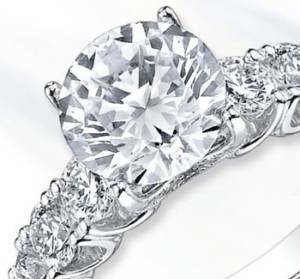 Choosing a setting is important as it determines the style as well as the security of the stones. Each setting changes how visible the stones will be, and how easy the ring will be to wear, clean and care for. 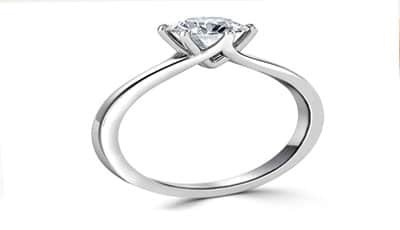 The claw setting is one of the most popular settings for rings. Claw are basically metal pins that hold the stone in place. Claw settings are usually made with four or six claws so you have choice which comes down to the individual. In general, the more claw a setting has, the safer it is, as there are more claws that keep the stone from falling off the setting. Fewer claws make a setting less secure, but they also make the diamond or gemstone more visible as it lets more light into the diamond. The bezel / rub setting is another popular design. This setting holds the diamond or gemstone with a strip of metal that is wrapped around the stone. There are two types of bezel/rub settings – the full bezel setting and the partial bezel setting. The full bezel setting encircles the stone entirely, along its circumference. This type of bezel setting is the safest, but it also conceals a significant part of the stone. The partial bezel setting does not cover the entire edge of the stone – it leaves its sides visible. The parts of the stone which is not covered, the diamond or gemstone is visible compared with the full bezel setting. The tension setting holds the diamond or gemstone by pressing it between two metal bands. This pressure is what keeps the stone in its place, and this is also where the name of this setting comes from. Each tension setting is specially designed to fit the dimensions of the stone it has to hold. 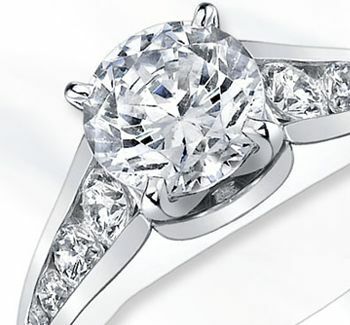 The three-stone setting is very popular. 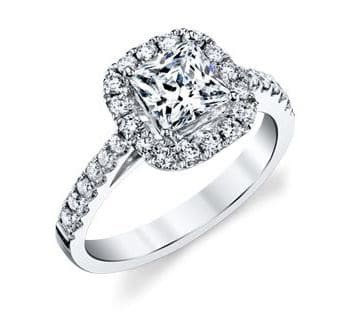 Most commonly, it has a center stone surrounded by two side stones, which can be smaller or the same size. This setting is a great choice for a diamond ring and for occasions such as a wedding or an engagement. The diamonds or gemstones in the mounting can be held by prongs, bezels, or another type of setting. Read about the pros and cons of each of these settings in the respective sections above. The cathedral setting mounts the stone high above the ring’s shank. 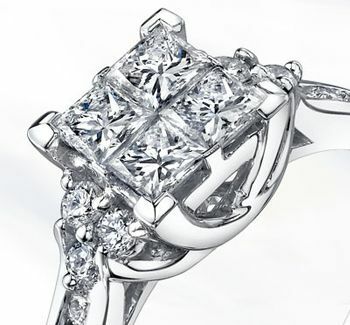 The diamond is held by arches of metal, and this is where the name of this setting comes from. 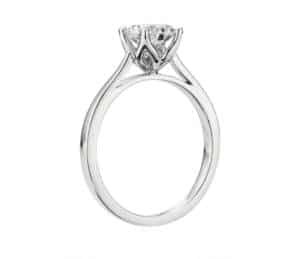 In a cathedral setting, the center stone itself is usually held with prongs or a bezel. The Halo setting is a style in which the center stone is surrounded by smaller diamonds or other stones. You can have single and double halo settings – the former has only one circle of stones surrounding the center stone, while the latter has two. The cluster setting is made up of smaller stones clustered together. It is somewhat similar to the halo setting. A cluster setting can have a bigger center stone surrounded by a cluster of smaller stones, or it can have stones that are all of the same size. 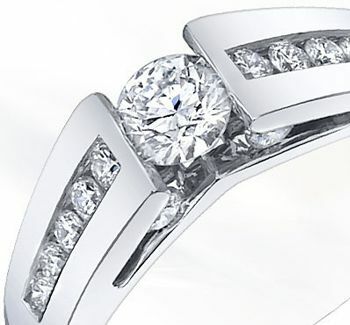 The channel setting holds diamonds or other stones in a groove, or a channel, in the band of the ring. These stones are smaller and usually serve to complement the bigger center stone, which is usually mounted in another type of setting such as a bezel or prong setting. There are also rings that have only channel-set stones with no center stone. 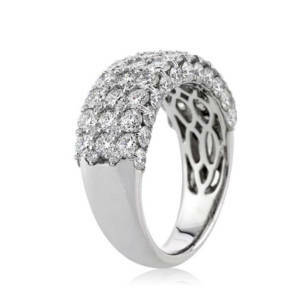 The pave setting is made with very small diamonds inserted into tiny holes drilled into the ring. 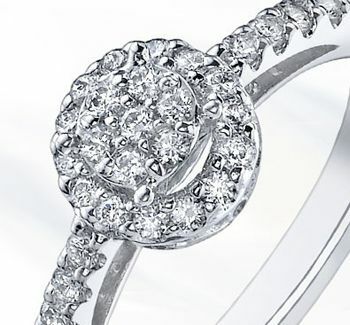 The stones are held securely in their place by small droplets of metal placed between the diamonds. The result is a surface studded with small stones which are held at the edges by even smaller prongs. 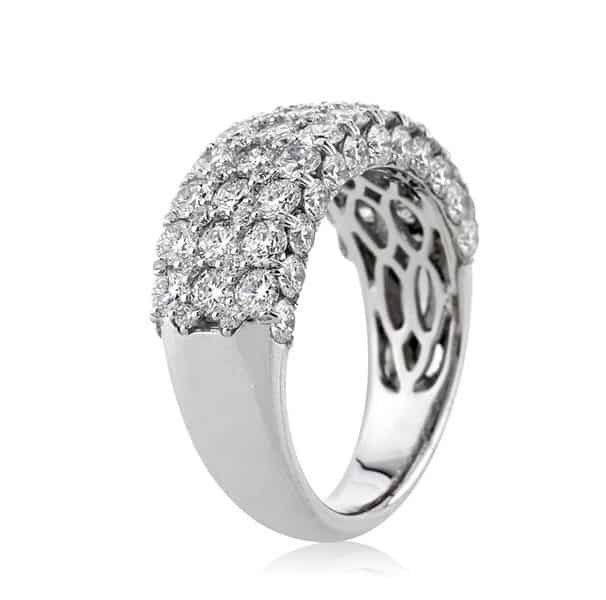 There is a variation of this setting called “micro-pave,” which is made with diamonds that are even smaller than the ones usually used for pave settings. An illusion setting is smaller stones, usually princess cuts, set next to each other and held from below to give the illusion of a larger diamond. This setting is more intricate than others and creates a visually interesting piece. 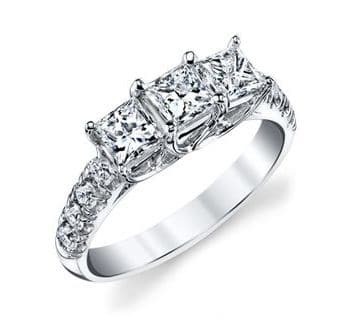 If you would like some more help with your engagement ring setting, then please contact us.